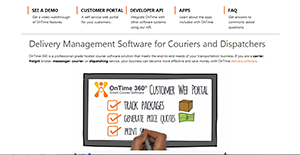 OnTime 360 is a cost-effective and time-saving delivery management software equipped with powerful tools and features for courier companies. It is designed to meet the time-sensitive demands of a delivery business such as a dispatching service, messenger, courier, carrier, and freight broker. The courier software solution is fully cloud-based so you won’t have to do any installation work. It also eliminates the risks of losing data from a fried hard drive or broken computer. This guarantees data protection and management. It has a smart client technology and broad mobile device and carrier support for all levels of users in your company including the owners, managers, couriers, messengers, drivers, dispatchers, customer service representatives, and customers. OnTime 360 also offers technical support and QuickBooks integration. Oversee your team’s tasks and choose specific permissions a member can access the user management feature. Cut down time by utilizing automated timesheets and managing wages efficiently so you will have more time to handle high-level operations. The Smart Client technology also lets you work both online and offline so you won’t meet any hitches when there are Internet connectivity issues. Vehicle maintenance is crucial to your business. You will receive alerts when a vehicle has reached a scheduled date or mileage wherein maintenance is required. Additionally, you can also track and manage all orders in your system through searching, sorting, and filtering. All addresses where your company has delivered to or picked from is saved so you can provide customers in the same area with real-time pricing quotes. This also configures routes for a scheduled or routine pickup. When it comes to your invoice and payment management, OnTime 360 seamlessly integrates with your QuickBooks accounting information. Invoices can be generated automatically to save time. Meanwhile, you can set pricing formulas for different options and services which are calculated by the system and then given to the dispatcher. Other pricing configurations include maintaining your charges to customers and wages to subcontractors and dispatchers. A user-friendly interface design reduces the learning curve for your dispatchers and CSRs. This lets you easily view real-time information on where drivers so you can make informed decisions in assigning new orders. You will have multiple methods of communications through internal messaging, text, or email in case voice communication is not possible between the driver and dispatcher. The courier software solution centralizes unique customer needs with comprehensive order entry tools. You can also view and edit information through the common interface for a shipment or package. Color coding is used for quickly identifying which orders are impending or past due. There is also a robust wage calculation tool where the user can clock in and clock out to accurately track the orders they processed, the time they logged, and the distance they have driven. Drivers, messengers, and couriers are always on the go. Hence, their phone is a vital device for communication. OnTime 360 has a Wide Mobile Device Support feature which means it’s compatible with any device. For those who are non-smartphone users, they can still integrate the system with its WAP Device Support. In case of unreliable cellular service in some locations, drivers can still work without internet connection. Its global database helps drivers search for the customer quickly both online and offline. An assigned order queue (direct assignment, unassigned order, and route stops) improves efficiency. There is an automatically-generated POD for drivers using the order information. As requested by the customer, the driver can use their mobile device for COD and Digital Signature Capture in real time. Other features such as GPS, time clock, and barcode scanning are available. Providing a convenient and effective service to your customers is vital for growing your delivery business. The software has a tool called Customer Web Portal. This is where your customers can input their own personal address books. They can also see enter their order, view their order history, and access dispatching tools. The website is customizable to your branding design and existing layout with its ASP.NET Master Page technology. Give your customers the control to dispatch on their own and view the status of their orders in a timely fashion. They can also print their own waybills, bills of lading, and shipping labels which saves you and your customer’s time as they no longer have to contact your company for it. Each enterprise has its own characteristics, and can call for a particular type of Business Process Management Software solution that will be adjusted to their business size, type of clients and staff and even particular niche they deal with. You should not count on getting a perfect app that is going to be suitable for each business regardless of their background is. It may be a good idea to read a few OnTime 360 reviews first and even then you should remember what the solution is intended to do for your business and your employees. Do you require an easy and intuitive service with only essential features? Will you really make use of the complex tools required by pros and large enterprises? Are there any particular tools that are especially useful for the industry you work in? If you ask yourself these questions it will be much easier to get a reliable software that will match your budget. How Much Does OnTime 360 Cost? We realize that when you make a decision to buy Field Service Management Software - FSM it’s important not only to see how experts evaluate it in their reviews, but also to find out if the real people and companies that buy it are actually satisfied with the product. That’s why we’ve created our behavior-based Customer Satisfaction Algorithm™ that gathers customer reviews, comments and OnTime 360 reviews across a wide range of social media sites. The data is then presented in an easy to digest form showing how many people had positive and negative experience with OnTime 360. With that information at hand you should be equipped to make an informed buying decision that you won’t regret. What are OnTime 360 pricing details? What integrations are available for OnTime 360? If you need more information about OnTime 360 or you simply have a question let us know what you need and we’ll forward your request directly to the vendor.